Inventory management is the most critical aspect of fulfillment and directly impacts program success and profitability. When customers, dealers, and sales reps need a piece of literature or a fabric sample, they need it now. If that doesn’t happen like clockwork, you lose sales opportunities and may take on unnecessary inventory costs due to hoarding in the field. Leed Fulfillment’s inventory system keeps a perpetual inventory of your items and is automatically tallied with each request and movement. We reconcile the perpetual counts with systemized ABC physical counts to reach an enviable 99.62% accuracy. Our management systems allow you to control order quantities, timing intervals, and even budgetary values for your inventory items. We make sure you have a complete picture of what pieces are the most popular, who is using them, and when you’ll need to reorder to avoid outages. 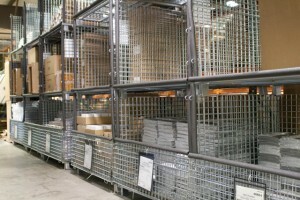 We also maintain a large area dedicated to locked, limited-access storage. We secure a wide range of sales tools for our clients here, including high-value promotional items.